In the old days, if you were fitting out a kindergarten you would have ordered chairs, tables and a big mat. On the shopping list now? Microsites, 3D landscapes and playforms. A few years ago we featured Feelgood Designs, a company that specialises in making unique educational furniture and play structures. Feelgood Designs pieces can be found in all sorts of places from play centres and schools to London’s Heathrow airport. Their latest design is Chicchi, a system of irregularly shaped platforms that can be fitted together and layered to create a soft seat landscape of different heights. 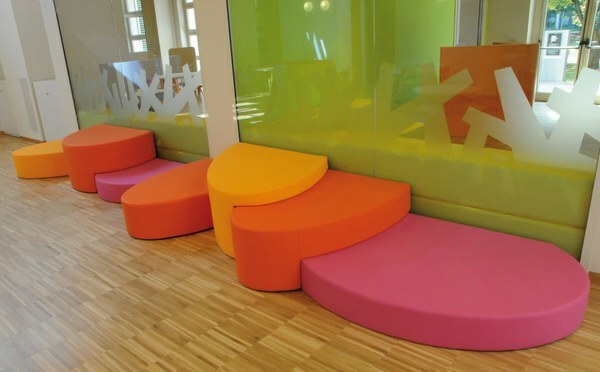 Not only does the seating create a colourful and informal space, it has loads of kid appeal. Have you ever watched kids in a place that has oddly-shaped steps and platforms? They can’t help but jump from one to another. See the catalogue for the full range from Feelgood Designs, including their amazing microsites, 3D landscapes and playforms. Contact Feelgood Designs directly to buy.